We are desperately in need of some sanity as the British political and media establishment seek to generate yet another “new anti-semitism” crisis, on this occasion to undermine a Jeremy Corbyn-led Labour party before the upcoming local elections. 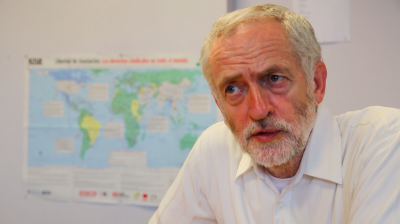 Corbyn and his supporters want to revive Labour as a party of social justice, while Britain’s elites hope that – in a period of unpopular austerity – they can turn the Labour leadership’s support for the Palestinians into its Achilles’ heel. This is nothing more than a class war to pave the way for a return of the Blairites to lead Labour. Israel and its supporters in the UK are only too willing to help fuel the hysteria, given their own fears that a Corbyn-led government would be bad news for an Israel committed to destroying any hope of justice for the Palestinians. I have analysed earlier efforts to foment panic about a “new anti-semitism”, including during the early years of the second intifada, when Israel’s popularity plummeted. As now, Israel tried to deflect attention from its increasingly clear abuses of Palestinians – and its lack of interest in peace-making – by suggesting that the problem lay with critics rather than its policies. You can see my articles about this here, here and here. Then, the chief targets of the “new anti-semitism” smear were supposedly leftist elements in the media who were concealing their true goal – vilification of Jews – behind criticism of Israel. The campaign, despite being patent nonsense, was successful enough that it cowed the few critical voices in the media – and terrorised senior editors at the BBC into supine compliance with Israel’s narrative. That’s why we should take this current campaign seriously and worry that Corbyn, who is already on the back foot, is in real danger of conferring credibility on this whole confected narrative of an “anti-semitism problem” in Labour simply by giving it house room. The only suitable response is derision. We should be particularly wary of the wolves in sheep’s clothing. The Guardian’s Jerusalem bureau chief Peter Beaumont, for example, was set the task of bolstering absurd claims against Ken Livingstone for being an anti-semite after he stated – admittedly clumsily – a historical truth that for a period of time Hitler and the Zionist movement shared enough common ground that they held negotiations about transferring Jews to Palestine. He could have gone further, in fact. A century ago, many European anti-semites, including most members of the British government that formulated the Balfour Declaration in 1917 to create a “national home” for Jews in Palestine, upheld the same logic as the Zionist movement. They saw the Jews as a race apart. They thought in terms of a “Jewish question”, one that needed solving. And for many, the solution was to export that “problem” far away, out of Europe. This was not surprising because Zionism emerged both in reaction to Europe’s ugly ethnic nationalisms – where it was normal to speak of “races” – and mirrored these nationalisms’ failings. The Zionists wanted to claim for themselves the same traits as other European “races”: nationhood and territory. And the European anti-semites were only too happy to oblige – especially if the primary victims were going to be brown people in the colonies, whether in Uganda or Palestine. Fortunately, there is an antidote to Beaumont’s kind of stenographic journalism, apparently written up after an afternoon at Israel’s Holocaust museum Yad Vashem, in the form of this interview with Norman Finkelstein. It is full of profound insights. Finkelstein puts into perspective both Livingstone’s comments and the orginal “offending” Facebook post by Labour MP Naz Shah that triggered the latest hysteria. Finkelstein notes that the post (one dredged up from two years ago), which shows a map of the United States with Israel superimposed, and suggests resolving the Israel-Palestine conflict by relocating Israel to the US, was clearly intended to be humorous rather than anti-semitic. I would make a further point. It is also obvious that the true target of the post is the US, not Jews or even Israel – making the anti-semitism claim even more ridiculous. The post’s implicit argument is that, if the US government and ordinary Americans are really so committed to the creation of a safe haven for Israeli Jews, then would it not be far wiser to locate them inside the US rather than supporting at great expense a garrison state in the Middle East that will always be at war with its neighbours? This is classic satire, and the fact that almost no one in the British media and political establishment can see this – or, in the case of Corbyn and his allies, afford to admit it – is the real cause for concern. In addition, Finkelstein concludes with a very powerful argument that the “new anti-semitism” canard is likely – and possibly intended – to fuel the very anti-semitism that it claims to be exposing and challenging. Our Corbyn is Bernie Sanders. In all the primaries in the US, Bernie has been sweeping the Arab and Muslim vote. It’s been a wondrous moment: the first Jewish presidential candidate in American history has forged a principled alliance with Arabs and Muslims. Meanwhile, what are the Blairite-Israel lobby creeps up to in the UK? They’re fanning the embers of hate and creating new discord between Jews and Muslims by going after Naz Shah, a Muslim woman who has attained public office. They’re making her pass through these rituals of public self-degradation, as she is forced to apologise once, twice, three times over for a tongue-in-cheek cartoon reposted from my website. And it’s not yet over! Because now they say she’s on a ‘journey’. Of course, what they mean is, ‘she’s on a journey of self-revelation, and epiphany, to understanding the inner antisemite at the core of her being’. But do you know on what journey she’s really on? She’s on a journey to becoming an antisemite. Because of these people; because they fill any sane, normal person with revulsion. Here is this Muslim woman MP who is trying to integrate Muslims into British political life, and to set by her own person an example both to British society at large and to the Muslim community writ small. She is, by all accounts from her constituents, a respected and honourable person. You can only imagine how proud her parents, her siblings, must be. How proud the Muslim community must be. We’re always told how Muslim women are oppressed, repressed and depressed, and now you have this Muslim woman who has attained office. But now she’s being crucified, her career wrecked, her life ruined, her future in tatters, branded an ‘antisemite’ and a closet Nazi, and inflicted with these rituals of self-abasement. It’s not hard to imagine what her Muslim constituents must think now about Jews. These power hungry creeps are creating new hate by their petty machinations.